There is probably no one more ready to pull into Kentucky Speedway than Team Penske’s Brad Keselowski. A three-time Monster Energy NASCAR Cup Series winner at the 1.5-mile track – best among his peers – Saturday night’s Quaker State 400 (at 7:30 p.m. ET on NBCSN, PRN, SiriusXM NASCAR Radio) may be just the kind of panacea his season could use. What to Watch For: Starting position has been especially telling at Kentucky. Four of the seven races have been won from the front row. Six of the seven have been won from a top-10 place on the grid. …Toyota’s victory Saturday in Daytona Beach gives it a series best nine wins this season. 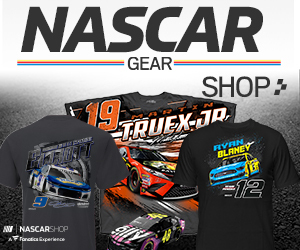 …Erik Jones’ final lap victory at Daytona last weekend means that the winner of both 2018 Daytona races led only the last lap. … Chevrolet is looking for its first victory at Kentucky. It’s the only active track on the schedule where the make has not won yet. … Brad Keselowski (3) and Kyle Busch (2) are the only multi-time winners at the track… Team Penske and Joe Gibbs Racing lead all organizations with three victories each. …Keselowski’s 2014 win is only time this race has been won from the pole. … Kyle Busch leads all drivers with five top-five finishes. Denny Hamlin, Keselowski, Matt Kenseth and Ryan Newman have three top fives each here. … This will mark Hendrick Motorsports driver Alex Bowman’s 100th start. … A victory this week for Jimmie Johnson would be his 84th and tie the seven-time champion for fourth place on the all-time wins list with Darrell Waltrip and Bobby Allison. What to Watch For: Christopher Bell’s third-place at Daytona last week surged his Rookie of the Year advantage to 44 points over Tyler Reddick. … They are the only drivers locked into the Playoffs to date. … There have been six first-time winners at Kentucky, most recently Reddick in September, 2017. … Three Monster Energy Cup drivers are entered this weekend – Kyle Busch, Ty Dillon and Paul Menard. … Points leader Elliott Sadler scored his last career win at Kentucky, winning in September, 2016. …Sadler holds a 16-point lead over Daniel Hemric in the standings – both drivers still looking for their first win of the year. 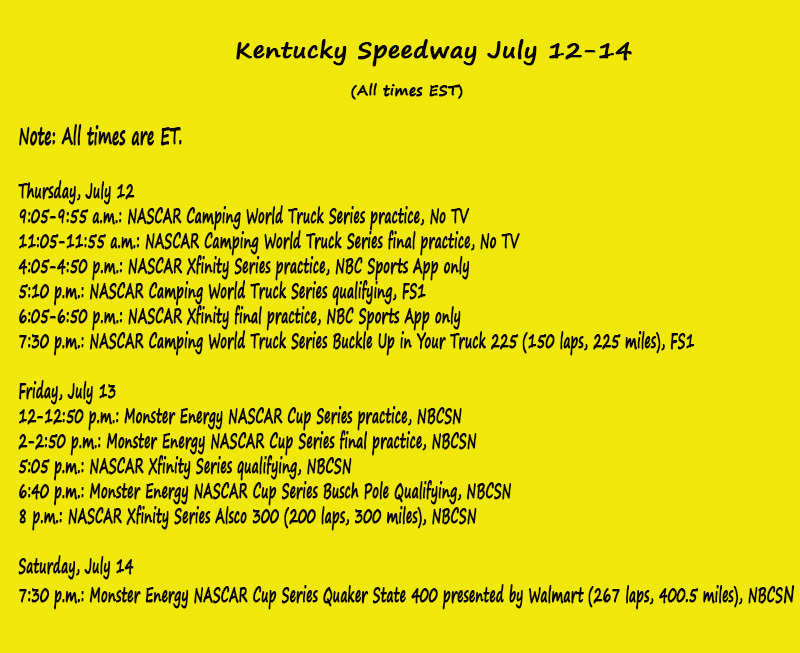 What to Watch For: Former series champion Matt Crafton is the only driver entered this week with a previous win (in 2015) at Kentucky. … Brett Moffitt, who won the series’ last race in Chicago two weeks ago, made his series debut at Kentucky in 2013. …Johnny Sauter holds a 66-point advantage over Noah Gragson in the standings. The former champion Sauter is looking to win five races in a season for the first time in his career. … Gragson, 19, has earned a top-five starting position in all but one race this year and won three pole positions (at Dover, Del., Kansas and Chicago). His six stage wins is best in the series. 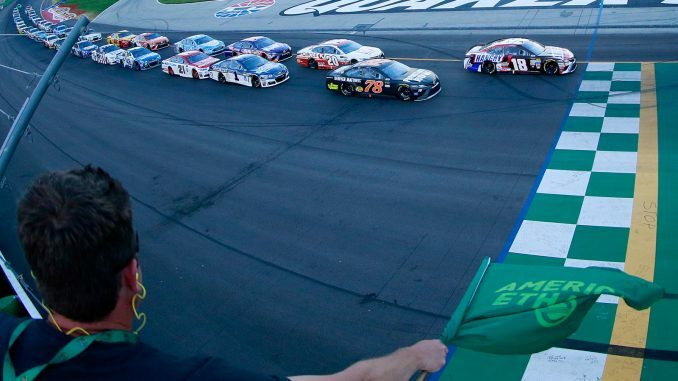 … Only three drivers have won multiple times at Kentucky – Ron Hornaday Jr., James Buescher and Kyle Busch – and none of them are in this week’s field. …. Myatt Snider is besting this year’s large rookie crop, ranked ninth with five top-10s. Dalton Sargeant is the next highest ranking rookie in 11th. And Todd Gilliland, who just turned 18 and missed four of the 11 races – leads all rookies with 64 laps led. His runner-up at Gateway Motorsports Park is best among the rookie class.